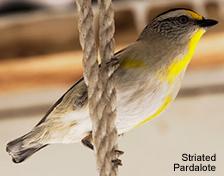 The Striated Pardalote (Pardalotus striatus) is the least colourful and most common of the four pardalote species. It is a very small, short-tailed bird that is more often heard than seen, foraging noisily for lerps and other small creatures in the treetops. Striated Pardalotes occupy a vast range of habitat types, from tall mountain rainforest to arid scrubland, and are found in all parts of Australia except some of the Western Australian deserts. Four full species were originally named, and are clearly recognisable in the field. They are now known, however, to be merely well-defined subspecies. The Yellow-tipped Pardalote (race striatus) is found mainly in Tasmania but crossing the 200 miles of Bass Strait to the mainland each winter in a migration.The Striated, race substriatus, central and western Australia.The Eastern Striated, race ornatus, from the sub-tropical east coast.Two races of the Black-headed, melanocephalus and uropygialis - Australia, from north-eastern New South Wales to north-eastern Queensland, and across the Top End to the Kimberley. All five forms have a black cap which may be striated but never spotted, a white wing stripe and a small, conspicuous wing spot—bright red in all except striatus, which has a yellow spot.